The Public Education Modernization Act (HB 131) was introduced today in the state of Utah. To discuss the bill and the vision behind it, House Speaker Becky Lockhart spoke with one of our local media outlets during the lunch hour. Unlike many of the 1:1 plans we seem to be seeing these days, this one does feel slightly different. I love how difficult questions continue to be considered; before public monies are spent. In spite of her struggles while fumbling through an answer to my question about sustainability, I was impressed to see that Speaker Lockhart does understand that this will need to be an ongoing investment in both technology and teacher development. I hope the rest of our Legislature understands this, too. Furthermore, I was pleased to hear of the confidence she places in LEAs and loved that her timeline accounted for students receiving the devices well after infrastructure, PD, and other issues are addressed as a part of program implementation. Finally, her hesitance to take a one-size-fits all stance in device selection was also promising. How will 1:1 devices be used to improve teaching and learning? What is our plan, beyond purchases? How much of the 1:1 budget will go toward technology coaching (sustained PD for teachers)? What does the 1:1 timeline for implementation look like? How will success be measured? What will we do with students whose parents refuse to allow them to use technology? 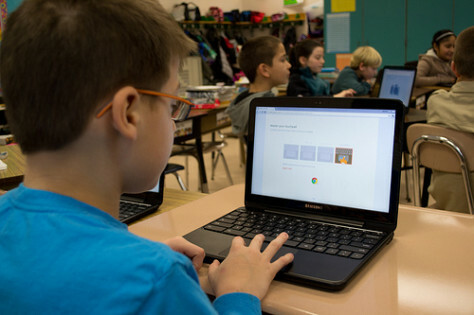 Will Internet access be provided for students that don’t have access at home? If not, then why 1:1? What does 1:1 technology access look like in your area? What questions do you think need to be answered in order to avoid potential pitfalls? Of all plans going into a 1:1 program, which issues do you feel are most critical to address well?